Ganga Platino is the sort of project which announces to the world that the eastern suburbs of Pune have arrived. Such has been the phenomenal growth rate of this suburb that you can see rapid development & and a stark divide between the western and eastern Pune now diminishing. 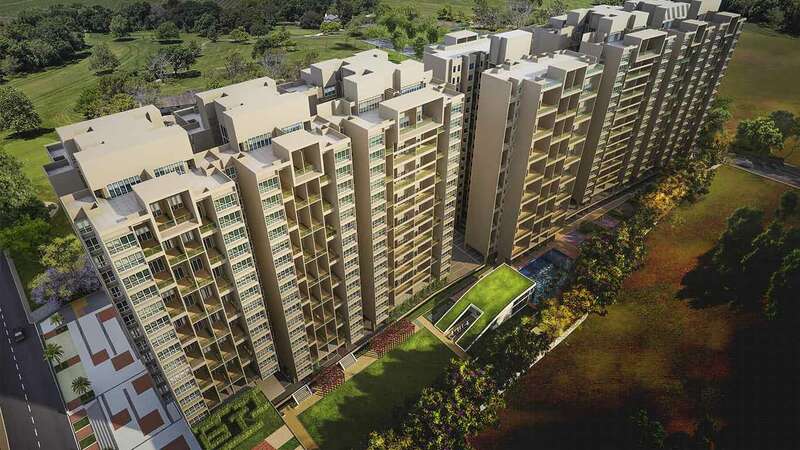 Goel Ganga who has multiple projects in the vicinity launched Platino in 2014. This 6-acre plot includes 7 towers of 16 storey each with 4 apartments per floor. Costing 80 lac onwards around the launch period, selling this product would be a challenge, let's have a look if Platino at Goel Ganga lives up to the same. Located in Kharadi one of the fastest growing and best-planned suburbs the seven towers inspire through its modern & elegant design. You can choose between 1260 sq.ft. two-bedroom apartments, 1779 sq.ft. three - bedroom apartments and 2,700 sqft. four - bedroom apartments with penthouses. There is also a commercial/ retail space on east and west side of the project starting from 1300 sq.ft. Located next to Hotel Radisson & Four Points Sheraton this project is a winner in terms of location. In close proximity to the EON free zone is another major advantage. This 45 acres of land area in the MIDC Knowledge Park area of Kharadi. The presence of corporate giants like Synechron, Eaton, Wipro, Reliance, Polaris, Tata Communication and Zensar has made Kharadi a paradise for IT professionals. Prima facie the master plan lets you down. The plot shape in more conical less rectangular hence the compromise on design. Towers A1, A2, A4 & A3 don’t ensure a good view from the apartments. Apartments in B1 & B2 & A2 will have a partial garden/ swimming pool view. Having said that most amenities are slotted well given the constraints of the plot. 2BHK: The total floor area of a 2 BHK is 1260 sqft (saleable) and every square foot is well utilized. The living/ dining is rectangular shaped and opens up in the terrace which makes the living space look spacious, allows light and ventilation to enter the apartment. The master bedroom is approx than 170 sqft. in size which is larger than the normal bedroom sizes in Pune. The kids room or second bedroom is of size 13 *11 which is again decent. The toilets are and kitchen are decently spaced out and a separate utility space is provided of size 5*5 which can be utilized for washing purpose and also as store room as well. The only thing which is missing is space for a built-in wardrobe. 3BHK: 3bhk apartments are of size 1776 sqft. The living room is large of size 12*22 and has access to the kitchen which is an advantage. Just attached to living area is a glass door is a private deck of size 8*8 which is a huge positive (this living space in royal in nature). The kitchen has a huge storage space which will provide you with good storage space. And that’s not it the master bedroom come with an attached deck and a spacious bathroom. The only hitch is the size of the bedrooms (12*11), (13*11) & (12*11). They should have been bigger and better. The apartments are loaded with amenities. The apartment has imported marble flooring cladding all over. The master bedroom comes with wooden flooring & the landscaped terrace with anti-skid flooring. The apartments are air conditioned and come with a modular kitchen. 1. The project has multiple amenities, apartments with decks/ terraces. 3. The developer has a lot of stake in the area and will play a role in defining the skyline of the vicinity. It's definitely worth considering, however, we do advise you look at other township projects and the views from your flat before booking. Owner vs Renter: How to Make It Work ! FlatGradings is India's First Apartment Review portal. We collect reviews from owners/renters about their apartment. In-turn these reviews help others in making an informed decisions about whether to buy/rent the apartment. We collect reviews based on few critical parameters which are the building blocks of any decision making process when it is about buying/renting an apartment respectively.